The new Behringer CRAVE is Analog. Im my experience. You need 'constant current' for things to 'work right'. The Battery would have to be near fully charged. I don't fancy changing 1/2 used batteries. About IK. My everyday MIXER is IK's iRig Mix. Proper BASS EQ. I am also familiar with their 'noise' complaints. You asked about battery operated synths with just an analog filter. I named just few that have more than that, to answer your question. You act like incorporating anything with any level of analog means making battery power an option not feasible. Is that the point you were trying to make? I'd sure like to see video of "Live" use of a Volca - or a monotron, for that matter. That''d be fun! There's tons on youtube. There's a fun set I enjoyed by Navi Retlav using the Volca series and the Monotron Delay and Stylophone. ... besides, Navi Retlav ..? no disrespect... just outside this "bubble"
Are you trying to get into the "what professionals use Reason? In order to justify the value of Reason" type talk? Like I was saying, there's lots of great, fun stuff on YouTube if you just search 'volca performance.' As far as stage use, I've seen it some, in similar fashion to using any groovebox. I don't see many people using a MIDI keyboard with it, even though they can. But we can certainly talk more about the volcas in the volca thread. Sorry I don't want to get this thread much more off topic. It was just a simple disappointment for me that the MicroFreak can't be battery powered without a USB brick/dongle. I guess I'm just more confused by the reasoning when creating a small "micro" keyboard, that is for the most part digital, that it wouldn't have a standard battery power option. I've seen people in Facebook posts making the same points. I mean, even folks here pointed out that Arturia found themselves hooking up a USB power brick when on a flight, so they understand the desire, right? They just didn't see it completely through I think. Or maybe there just isn't room inside the casing the way they designed it? There could be reasons. But I don't think it has to do with power draw/consumption. It is what it is. Sorry! Asked for a live video. I wont be getting one, it seems. too much text. i didn't bother reading past.. "Are you trying to get into...?" deflection. i simply asked for a posting of a video of live use... by someone Live. - It has an ANALOG FILTER. How many battery-operated synths w an/ANALOG filter do you know of?? Ever heard of the TB-303? It kind of gave birth to a complete genre (acid). hahahahaha!!! We couldn't use it with weeks/months/years of time alone w/it. THAT is the TB-303's history. Ever heard of that history? Does anybody have a video of live use of a Volca? Anyone? here's the tb-303. if it sounds like this, spare me. "No, O1B. I dont have a video of live use of the Volcan't." Closure is Great, isn't it? The question was about battery powered analog, to which you have gotten an answer. Your other comments mostly seem like a attempt to discredit people who have a different opinion than your own. If the man says you can't use a TB-303 live and that no one ever has, I for one believe him. Why would he lie? And if it's not possible to use a TB-303 live, it stands to reason you can't use a Volca live either. Certainly I don't think there's any point searching YouTube for "Volca live" or anything like that, because there won't be any results. Funnily enough, this digital "techy" sound is what everyone was criticizing about the M-Audio Venom, which went for $200ish. Back then everyone was screaming for "analog warmth", I guess that demand is satisfied now. 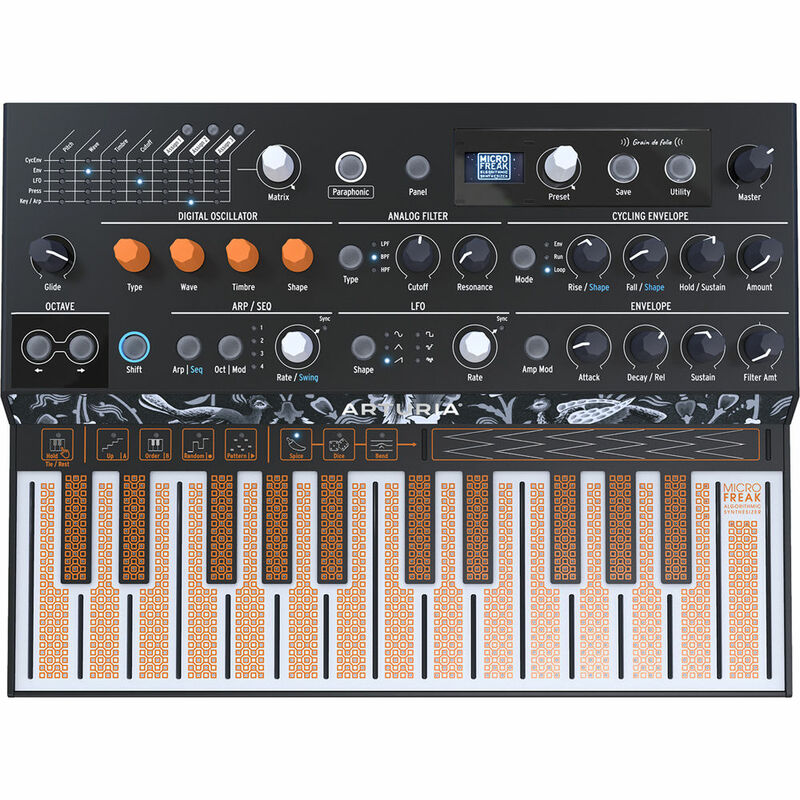 Agreed, they are different beasts with different feature sets and that Vyzex Venom software you have to use is awful, but if you are looking for that sound minus the granular bits plus a real keyboard with more keys at a cheaper price, take a look at the Venom. But the Venom was/is 100% digital w/1 (VA) Filter ...maybe that's why now hybrids (digital OSC + analog Filter) like the MicroFreak are better accepted. Last edited by Koshdukai on 04 Feb 2019, edited 1 time in total.
. Koshdukai's Music(al) Reason(ing) . @Koshdukai . @KVR: Spare licenses to trade . I did see someone say you can power it with a USB power brick...if you don't mind doing that. btw, I actually prefer using an external (easily interchangeable) USB power source instead of AA batteries. Maybe it's just timing. The Microfreak really appeals to me. But years ago all I wanted was analog everything in a hardware synth like this. I'm kind of over that now. There are plenty of options out there already. It's good to have something a bit different I think. ...... just pre-ordered one. Bugger it. Only live once. I couldn't resist this little beauty. First shipment! End of May ... per Sweetwater! I hope you AUSies get it sooner! The Mono to Poly-mode is Great! Worth the Digital. I haven't cracked the Matrix by looking at it (quickly) - but I am looking forward to such easy Routing. The keys are a Dream. A Ladder up from Volca's keys, and easier on the hands than a Roli, from the looks. Presets, LFO, ADSRs.... oh, Yes! Last edited by O1B on 20 Mar 2019, edited 1 time in total. The keys are a Dream. A Ladder up from Volga's keys, and easier on the hands that a Roli, front the looks. It just looks like they've squeezed a lot in to a nice small package (desktop real estate is at a premium), it's well priced, looks like a lot of fun to play around with. Irresistible. It even has CV i/o to hook directly to Eurorack. Very nice.